Romancea (1996) [7�13]. Kolem nulyb (1997) [6�26]. Vedlej�í pVíznakyc (1995) [10�57]. Safranbolud (2003) [8�10]. aAlice Rajnohová, fMark�ta Dvoř�kov� (pianos); cPercussion Ensemble JAMU (bMartin Opr�ál, bLadislav �i�ka, Luká� Krejcí); dJiř� B�rta, ePavlína Jelínková-Hlucha (cellos); fMarek Olbrzymek (tenor). �Hudbaby� is the name of a group of composers formed at the Jan�ček Academy of Performing Arts (Brno, Czech Republic) in 1997. �Hudba� is the Czech word for music while �Baby� is a colloquialism for women (not in the sense of the Americanism). All members of the group are represented on this disc except, it would seem, for Marcela Trtková-Vocílková. 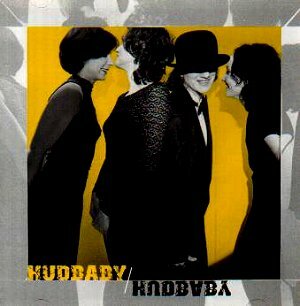 The group unveiled itself to the world in the 1998 Moravian Autumn International Music Festival � for further information, click here (http://www.kapralova.org.hudbaby.htm ). The first work we hear is that of Kateřina Rizizkov� (http://www.kapralova.org/KATKA.htm ), a Romance in two movements for piano. The first movement contains both reflective and manic elements, the latter with minimalist leanings. The minimalisms seem to sit on the cusp of the obvious influence (Jan�ček�s obsessive cell-repetitions) and a more States-side minimalist (Glass, Reich and the like). The second movement (no tempo indications are given) is more Bart�kian, once more with obsessive elements. The performance is a skilled one (by Alice Rajnohová), but the recording tends towards the tinny. Definitely worth hearing, though. Also by Rezizková is Kolem nuly (�Around Zero�). The composer writes, �Around Zero is a critical point where outwardly one still can�t see anything, but under the surface something is crystallising. It is also at this moment when an idea is born � the piquant boundary between contour and shapelessness�. Skilfully written for percussion, it is a sonic (gentle) tour-de-force. Lenka Foltýnová (http://www.kapralova.org/LENKA.htm ) contributes two works. First up is Vedlej�í pVíznaky (�Side Effects�) for percussion reveals a wide-ranging imagination. Almost as much as her note in the accompanying booklet: �I took very free imagination from stories by my great love Woody Allen, and after briefly �examining psychic phenomena� I said to myself: �Yes, but can a steam engine do this��. My kind of sense of humour. �Side effects�, Foltýnová says, �appear sooner or later in all of us. Do I hear a knocking at the door?�. More probably one of your own percussion instruments, I would have thought, but in the final movement its more tapping than knocking. Foltýnová�s second piece is the final one on the disc, Safranbolu (at least no translation needed this time, it�s the name of the Turkish city that inspired it. In particular it is that city�s calmness and beauty that touched the composer, and this eight-minute work is indeed hypnotically gripping. It is a perhaps unexpected way to close the disc, but an undeniably effective and haunting one. Long, yearning lines predominate. It is very well played by cellist Jiř� B�rta. Barbara �krlová�s Let mouchy (�The Flight of the Fly�) for cello and piano won first prize in the �Generace� composers� competition in 1999. �krlová (http://www.kapralova.org/BARBARA.htm ) is a composer and music therapist. Let mouchy is amusing in its direct imitation of a fly by the cello at the very opening, and Pavlina Jelínková-Hluchá is a finely expressive cellist in the longer legato lines. I found myself wondering whether it had the legs to last eight minutes at times, but it is a well-crafted work. Finally to Mark�ta Dvoř�kov� (http://www.kapralova.org/MARKETA.htm )and her wonderfully titled Nezelený muz (�Ungreen Man�). If only the text was replicated with a translation (it is a translation into Czech by Ludvík Kundera � father of the more famous Milan - of a poem by Hans Arp called �Bei gr�nem Kiebe�). Without recourse to text, it is a pleasure to report that the piece works marvellously on its own terms. I like the way Dvoř�kov� segments the words (�vsichny� at around the five-minute mark), so we can luxuriate in the sheer special sounds of the Czech language. A fascinating, memorable disc that certainly merits investigation.